When we were at the beach, this sign was on the door of the restaurant we ate at. I stared at Natalie, who sometimes behaves as though her volume toggle is stuck on high. What if we were kicked out? Would a waiter come over and whisper, “I apologize, but your child is noisy. You’ll have to leave.” They’d pack my food up at least, right? “Remember,” I whispered to Natalie as we walked inside. “You have to be quiet.” I pressed a finger to my lips. Now, I knew the restaurant was of the higher end. We eat there every summer. But usually it’s adults only with the kids being left at the condo. My cousins and I would go out one night, my parents, my aunt and uncle and grandma would go out another. This year not as many people could come to the beach so we all decided to go. I had been prepping Natalie for awhile. Shame on me and all of that. She should keep it down simply because I’m the parent and I asked her to. But Natalie doesn’t work that way. The sign on the restaurant door surprised me. That was new. It had not been there last year. This meant the restaurant meant business. Please don’t let Natalie embarrass me, I kept thinking. Not in front of my family. Not in front of my 92-year-old grandma. We settled down at a table. I stupidly asked the hostess for a kids menu. “There is none,” she explained kindly. I was informed that they did half portions on the spaghetti and other pasta dishes for the children. That was Natalie tapping her spoon against her bread plate. “No,” I said, sliding the plate away from her. “No, that’s noisy.” My eyes flicked around. Would a waiter emerge and remove us? “Why did they fold the napkins like that? I’ve never seen a napkin in a shape before,” Tommy said, wrinkling his nose at the napkin in front of him. It was twisted in a fancy looking mountain. “Some restaurants just do that,” I said. I sent a telepathic message to Tommy to please not fart. This was not the place to fart. Would we be removed for a fart? Not only did I have to make sure my kids behaved, but I also had to remember not to put my elbows on the table and to sit like a lady. Or try to. I had to remember to chew with my mouth closed. I needed to stop reaching for the delicious bread that was set in the middle of the table because when I ate it, I resembled a zombie from The Walking Dead feasting on a dead carcass. I have manners. I just tend to forget them when I'm around food. We ordered our food and I was pleased to see the kids were behaving. Natalie was amusing herself with the bread and Tommy was observing the world around him. Everything was going well! I was even able to enjoy some adult conversation. I was in the middle of listening to someone speak when I heard a clatter. It took me a few seconds to realize my daughter made the clatter because she had tipped over in her chair. I don't even know HOW it happened. I mean, the last time I observed her, she was rolling her bread into tiny balls. I don't know what occurred between that and falling off her chair. I thought, oh no, are we going to be kicked out because my kid forgot how to sit? I helped her up--she did not cry, thank goodness, but she did look mortally offended. "I don't know what happened. The chair is just mean," Natalie said with a frown. That was the last catastrophe, I'm proud to say. My kids were well behaved. They did not need hand held entertainment to keep silent like the other kids at a table across the way. This is mainly because I do not like to share my phone. I do not have children's apps on there because it's MY PHONE. I don't want their sticky hands all over it. I would have handed it over as the last straw but thankfully I did not need to. I remembered to chew with my mouth closed. I remembered to order dessert calmly and not shout out, "THE CHOCOLATE CAKE! Oh my heavens please give me the CHOCOLATE CAKE! My husband is deployed and I need the chocolate." We did not get kicked out of the semi-fancy restaurant. Oh my gosh. That sign is so rude! Talk about not child friendly! I love happy endings! I sure hope the food is worth it! My daughter only has one volume so I know we would have been kicked out. I am glad she behaved! Wow, I've never heard of a restaurant putting a sign up like that before. I would have been super nervous going in there with my kids too! I know personally I wouldn't even bother going into a place like that. I have enough stress trying to keep my kids in check at dinner let alone worry about making the restaurant mad. Im glad you were able to make it through it though and have a nice meal! But kudos to you for making it through unscathed! I don't share my phone either. Obviously not the popular opinion but I appreciate more and more restaurants making this move to better their patrons' experiences. 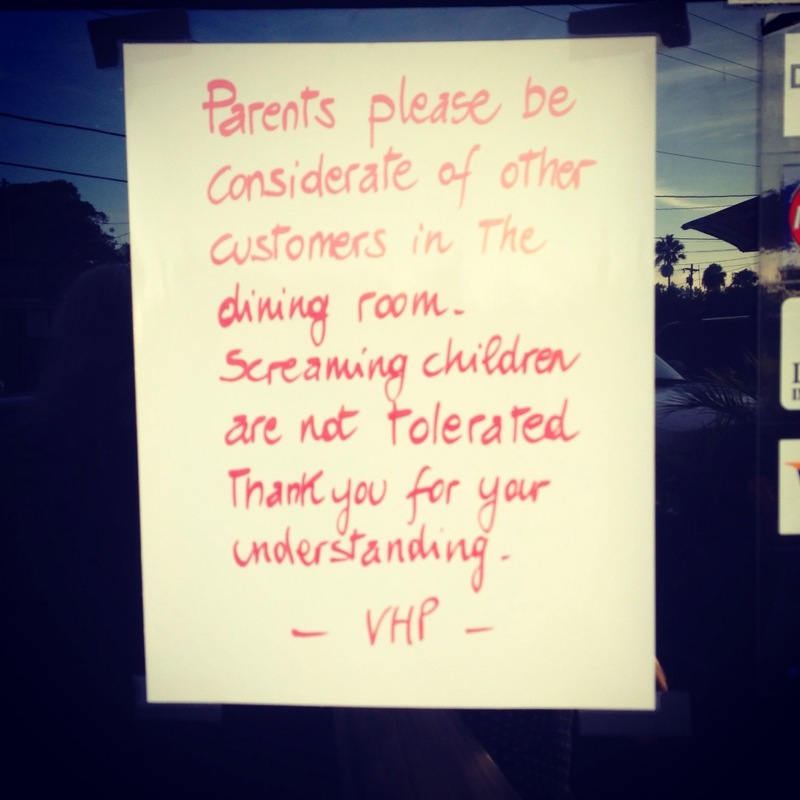 If a child cannot act appropriately in a restaurant, they simply should not be there. Your own home, whatever works for you but not where you can affect others. Recently we were at a group dinner that the children in the next table to us could literally be heard outside of the restaurant, so sitting next to them was beyond belief. We asked to be moved as we couldn't carry on a conversation with people we hadn't seen in years and only had the one evening with. When we asked to be moved, two other tables did the same. There weren't enough tables in the restaurant so the manager informed the parents of the problem children that they had disturbed enough of the other patrons, their food would be boxed as take out and they were no longer welcome in the establishment. Had the situation been reversed, I would have been mortified as a parent and probably not attempted a restaurant again for awhile. Instead, the woman spouted back excuses of new medications and required public therapies, how rude everyone else was that they couldn't tolerate children being children, etc. We all received 10% off of our checks because of the inconvenience which was appreciated as well. My parents used to tell us how they'd take all five of us out to dinner and we'd behave like saints. It was because we wanted ice cream after dinner. Then we'd get it and come home and be as rude and loud as ever! I do love your stories. No farts. Yes chocolate cake! Way to go for your kids holding the farts and screams! And you too for being calm about the chocolate cake! This is why we normally don't go out to eat and if we do, we pick a kiddo restaurant. Although generally my kids behave better in a restaurant than at home. Go figure! Glad you didn't get kicked out, I would have had a heart attack just in anticipation of what *might* happen. When my little guy grabbed an ice cube out of his cup and threw it across the restaurant and bonked someone on the head, I knew our restaurant days were over for a few years. If we wanted to go to a nice place the kids went to Grandma's. I am glad they kept it together, and you were able to have a nice dinner! They are growing up! Definite parenting win, but the sign is a little over the top! Sounds like a good dinner! I loved the “No shouting, or else you’ll be arrested.” comment!